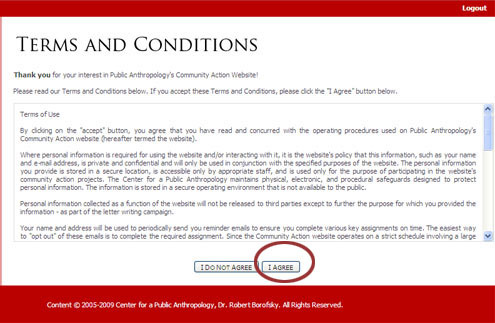 on Public Anthropology's Community Action Website. May I make an important suggestion? how to register, and what you do after you register. A. 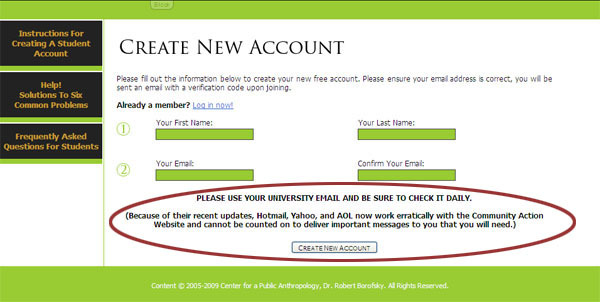 PLEASE USE YOUR UNIVERSITY ACCOUNT. It will cause less problems. If you prefer to use another account, please have the email sent to your university account and then forwarded to your other account. 1. The basic problem is that AOL is not compatible with our system (for complicated reasons) and Hotmail and Yahoo keep sending updates that we have to adjust to and we are always behind their updates. B. 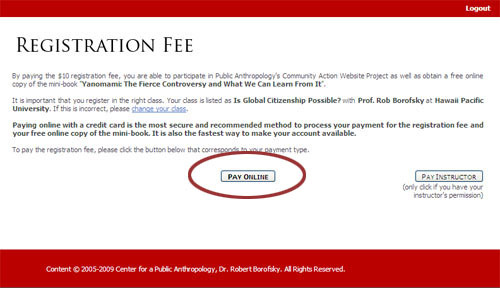 Please BE SURE TO LOOK IN YOUR BULK MAIL as well as your regular e-mail for emails from the Public Anthropology's Community Action Website. 1. 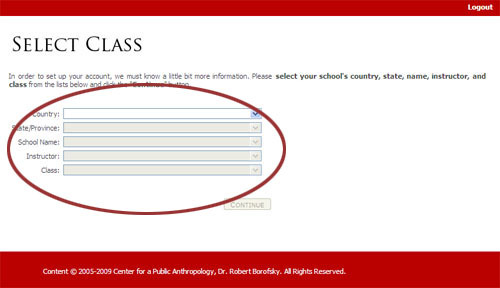 You create a new student account at www.publicanthropology.net. CLICK ON CREATE A NEW STUDENT ACCOUNT. It is circled in red on the page below. When you are done, click on "Create a New Account." 3. The Community Action Website then sends an email to the address you listed in your email. The email will look like this. a. Be sure to check your bulk mail folder to see if our email was put there. b. Sometimes your email server can be slow. It may only take 30 seconds to receive the email sent to you. But if your school as certain security systems in place or the university server is busy, it may take up to an hour. c. If you do not receive the email in an hour, please click on HELP! 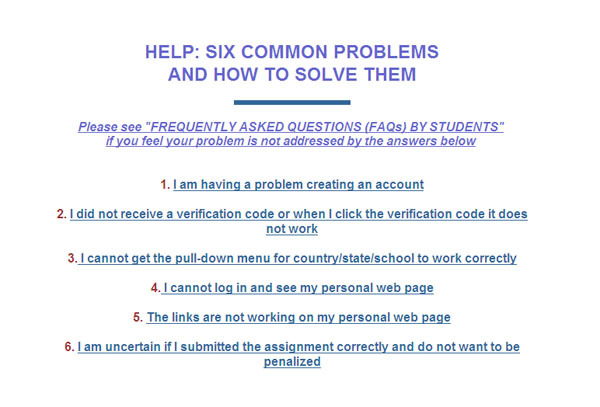 Solutions Six Common Problems ON THE LEFT SIDE OF THE web page and read the solutions under Problem # 2. One of these solutions should solve the problem. You will then see the following web page. YOU CAN USE HELP! FOR SOLVING ALMOST ALL OF YOUR PROBLEMS. 4. When you receive the email and open it up, it will look something like this. Click on the link circled in red. 5. Clicking on the veriication code will bring you to the following page regarding TERMS AND CONDITIONS. You need to click "I AGREE" to proceed. 6. The next web page is CREATE A NEW PASSWORD. When you select your password, be sure it is one that you will remember. It is safest if you use the same password as for your regular email account. 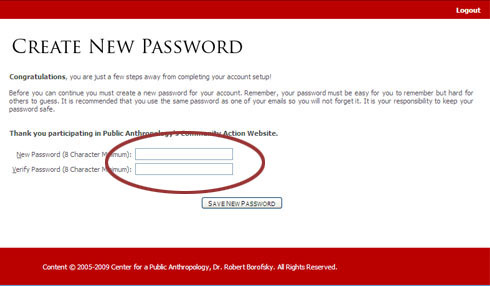 Click on "Save New Password." 7. You then see the following web page. All the questions focus on your School . You provide your Country, State/Province, School Name, Instructor, and Class. If you choose the wrong state, it will give you the wrong school, etc. But, if you follow directions, it is very easy. 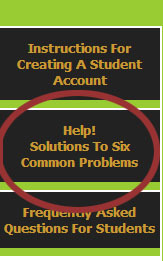 When you have completed all five categories correctly, the continue bottom will be highlighted. Press it. 8. The web page below then comes up. 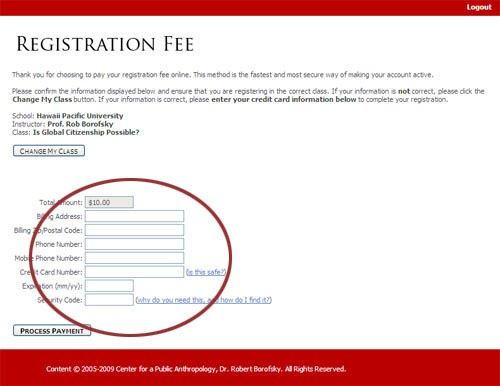 It allows you to pay your registration fee. You should try to pay online. (You can only, repeat only, pay your teacher if your teacher has already given you permission. You cannot choose to pay your teacher without your teacher's formal permission). 8a. You then fill in your credit card information. The process is totally secure and is protected by one of the leading credit card processing companies in North America. Thank you. You Payment has been successful. Please click "Continue." (2) You also might try another computer. For some reason, several students have found that changing computers makes things work fine. There could be something about the computer settings on your computer that is causing the problem. Or (3) if you are sure you are inputting the information correctly and it is not a problem with your computer’s settings, you might try another credit card. If you do not have one, you can pay a friend $10 and have your friend use his or her credit card to register. Hopefully, one of these solutions this will solve the problem. But if it does not please email me at webmaster@publicanthropology.org. 9. 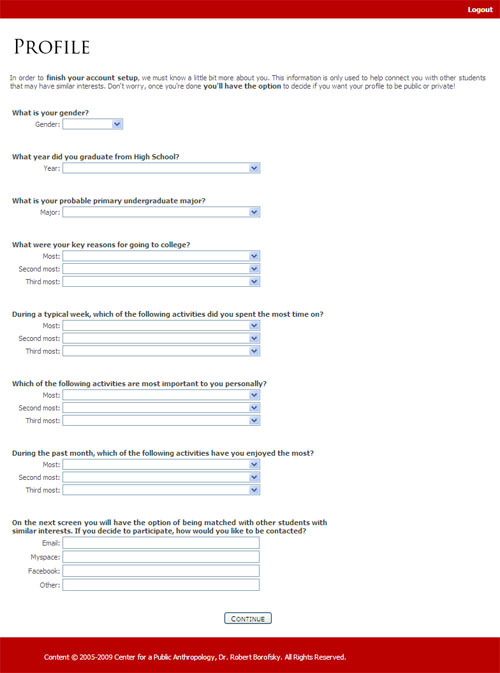 After you have completed paying your registration fee, please fill out the following personal profile. It will allow you to meet new people through the Community Action Website. The Website not only constitutes an activist and academic project but also a way to get to know other people who might share your interests. Please note that the information you provide remains private. It is only used to match you with other people who may share similar interests. 10. Once you click continue, you should see the following web page. 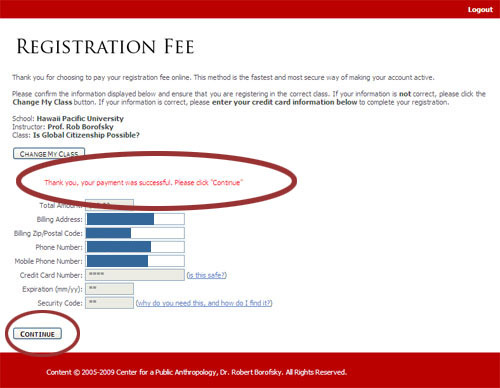 This will indicate you have completed the registration process. When the Action Period starts -- you teacher will tell you when it begins -- this web page will change and will provide you with the project's assignment and the appropriate links to complete it. You probably want to start begin the reading assignment that accompanies the project. To get the book, simply click on the highlighted link on the left side of the page and follow the directions. Parts of the book are in "living color" and, while fairly easy to read, the has lots of important ideas for you to ponder. 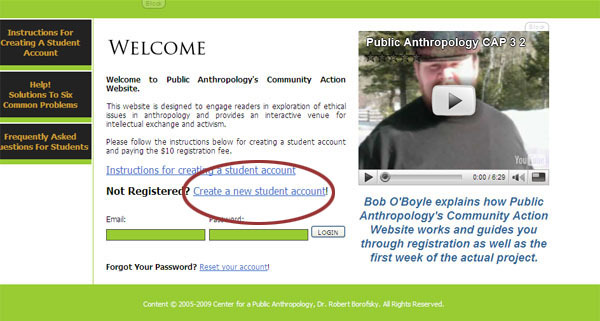 with Bob O'Boyle on the home page (www.publicanthropology.net), please watch it now. It will give you a good overview of what the project is about and what you do during the first week of the Action Period.